AiClay - a Haven of Miniature Food: Pass those chips! Ahem, so that wasn't just some photos eh? -sheepish. Now here's a story behind this last photo. Me and the boy were walking along the crowded street near the train station, where many vendors had laid out blankets to display their goods on. Amongst them were usual items like clothes, toys, keychains and the usual touristy fare. And then around the corner, this gem of a stall appeared. The man wearing the red-white cap is the maker of all these fabulous miniature leather shoes. Spot the ken modelling his shoes! Awesomely cute! :) The guy was incredibly humble, and he smiled widely when I asked if I could take some photos. Knowing that we were from Singapore, he revealed that his shoes are also for sale there (brought over by a local Singaporean), and they are selling for SGD$12 each. 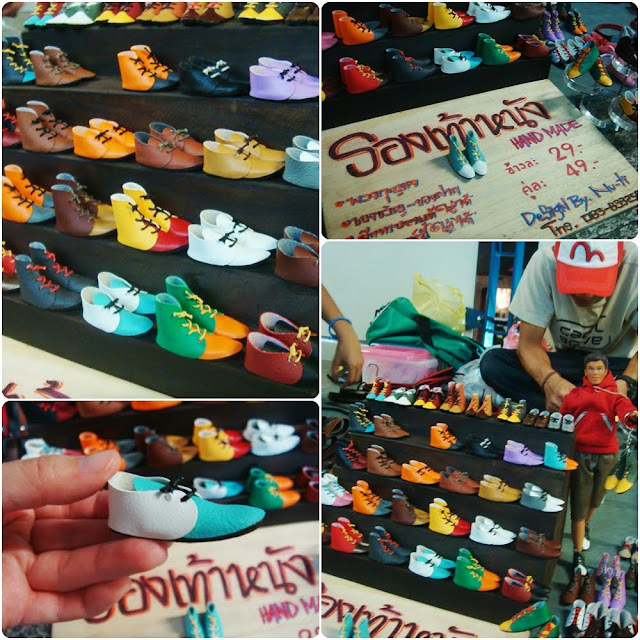 If you see the handpainted sign, one shoe is selling for only Thai Baht 29, which translates to less than SGD$2! The profit margin of the Singaporean 'importer' is crazily huge! Being a fellow crafter myself, this made me feel rather sad for the Thai maker that someone else is making so much money off his creations. Now back to those chips. When I was exploring on Flickr for images of real-life potato chips for inspiration, I chanced upon many photos of home-baked chips. Now that's interesting, and definitely sounds a lot healthier than manufactured, mass-fried chips. How unrealistic that there isn't any oil stains huh? I love this post! Thailand was one of those magical places that I will never forget. And those chips?? Fabulous! Magnificas chips y magnificas fotos, me encanta ver la vida urbana de otros países. i love these chips. i've never seen mini chips before. wonderful! Mid-autumn festival and its cakes. Cakes as round as the moon.